Go Local for Breakfast and Support the Home Team! 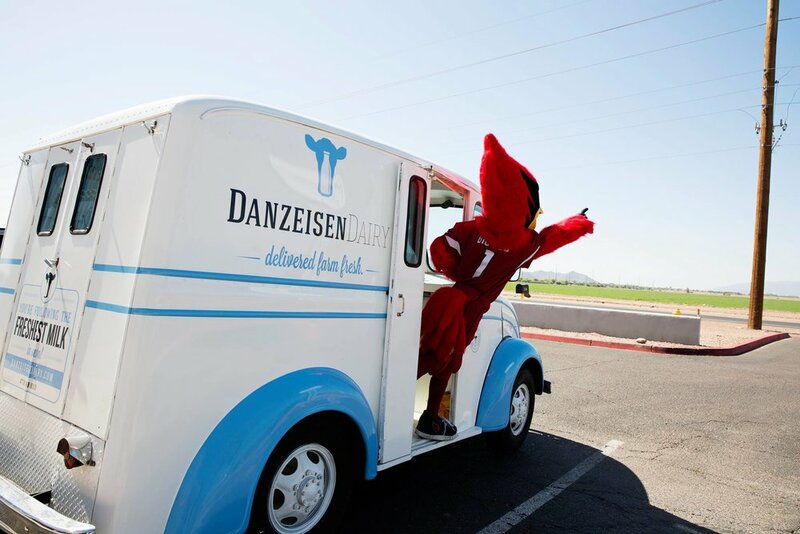 Danzeisen Dairy and Hickman's Family Farms are partnered up with the Arizona Cardinals! You can get your Cardinals branded Danzeisen Dairy bottle of milk today! Hickman's Family Farms, Arizona’s only commercial egg producer since 1944, is also super Egg-cited to announce that they are officially a Proud Partner of the Arizona Cardinals! In order to celebrate the new partnership, Hickman’s Family Farms announced the “The Perfect Play” giveaway! Now whenever you buy one of the new Arizona Cardinals branded egg cartons, you have the chance to win exciting prizes, such as tickets to Arizona Cardinals home games, Arizona Cardinals merchandise, and free cartons of Hickman’s delicious all-natural eggs! “We are extremely thrilled to align these two Arizona organizations to have some fun during this football season and throughout the year with co-branded products, promotions, fun family events, and an educational campaign to be announced later this fall,” said Billy Hickman, vice president of operations for Hickman’s Family Farms. Hickman’s Family Farms is not only revitalizing their cartons; they also announced a new initiative to give back to the local community. Throughout the upcoming football season, any time one of the Arizona Cardinals makes an interception, Hickman’s Family Farms will donate $500 to Cardinals Charities. Along with the donations, they are also rolling out a unique and exciting educational campaign that will bring agricultural curriculum to elementary and middle school classrooms throughout the state. There are more wonderful things to look forward to with this partnership during this season and later this year, such as a Hickman’s Family Farms Easter event at the University of Phoenix Stadium and much more. For more information, visit Hickman's Family Farms on our directory and follow along on social media. You can find the new cartons at your neighborhood grocery store.